Stoppages in ports around the world, in support of Spanish dockworkers, planned for tomorrow, March 10, have also been put on hold. The minority Partido Popular government is struggling to get parliamentary support for the vote with all other parties so far expressing opposition. The government is arguing that the changes are required under EU law. The European Court of Justice ruled against the existing port employment scheme in 2014, and since last year the EU has imposed a €134,000 daily fine on the Spanish government. Currently all hiring is through port based organisations with a register of qualified dockworkers. The proposed changes would open this up to competition from temping agencies and global corporations. Over a three year transitional period companies would be obliged to hire 75%, 50%, and 25% of existing workers during the first, second and third years respectively. In effect this means the regulated dismissal of the 6,150 dockworkers, with the uncertain prospect of being rehired on temporary contracts and lower pay. 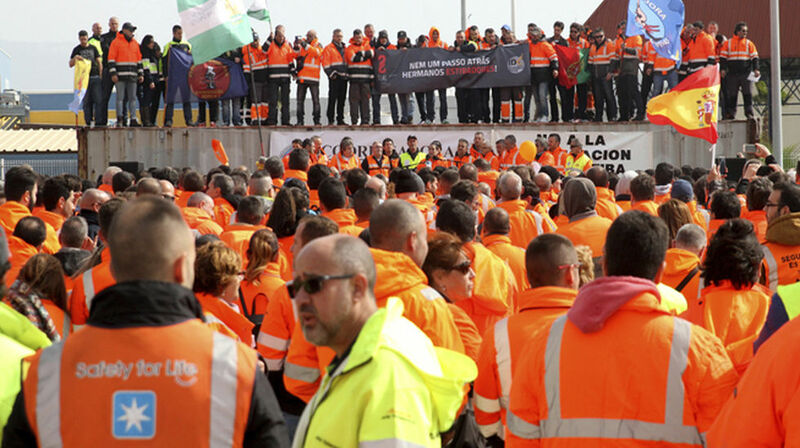 The main dockworkers' union, the Coordinadora Estatal de Trabajadores del Mar, is arguing that there are alternative ways to meet EU rules, without the loss of jobs and stable employment. If the changes go ahead then the one day strike on March 17 will be followed by further strikes on March 20, March 22 and March 24. According to this report the IDC/ITF international day of strike action planned for March 10 has been postponed to March 23. Thanks so much for writing this up, really helpful!